Minnesota Leafless Gutters offers multiple materials and styles of leafless gutter systems and serves the communities of Minneapolis, Minnesota. Seamless gutters are an important part of protecting your home against the ravages of Minnesota’s notoriously harsh weather. The staff of Minnesota Leafless Gutters is ready to give you the assurance of a roof without leaks, siding that has a fighting chance against rotting, and the confidence that your gutters won’t stop up with leaves, pine needles, branches, muck, or other debris. Not just any gutters will do the job necessary to combat the Minnesota climate. For long-term guarantees, you need seamless gutters. 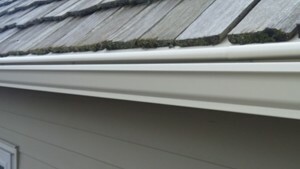 And if you make the decision to go with seamless gutters, you should select Minnesota Seamless Gutters to install them. People who don’t think much about their gutters and feel satisfied with contractor-grade gutters often learn lessons the hard way about the gaps that inevitably occur between the edge of their home’s roof and the gutters. Standard gutters allow water, snow, and wind to force debris under shingles and sometimes siding. Contractor-standard gutters may be serviceable for average weather and may perform without issue for some time. But even during long periods of gentle weather, leaves and needles will find themselves in your standard gutters, clogging them and posing a potentially huge problem when the inevitable rain or snow begins to fall. All too often, gutters fail homeowners and homeowners fail themselves by not thinking enough about the quality of their gutters. Seamless gutters, installed by Minnesota Leafless Gutters, allow homeowners to no longer think about the quality of their gutters. Seamless gutters provided by Minnesota Seamless Gutters will also add to the esthetic appeal of your home. The appearance of your home will reveal your taste and contribute to creating the look for your house you’ve always wanted. Seamless gutters are designed to complement your home and they come in a variety of colors and styles. You can choose between aluminum, copper or steel, and half-round, k-style or even have gutter covers installed by our team. But the truly great thing about seamless gutters is that they will not only look good, they will prevent your house from falling victim to the cumulative impact of heavy rain, heavy snow, and winds that can drive water, snow, and other debris underneath the shingles of your roof. But because seamless gutters prevent debris from clogging the gutters and downspouts, water and snow cannot accumulate like they do with conventional gutters. To many homeowners, ensuring that gutters do not detract from the house’s appearance is of paramount importance. Therefore, it is virtually impossible for water and snow to “dam up” under the shingles and cause damage to your roof or siding. For more information about a installing seamless gutter system for your home, call Minnesota Leafless Gutters today at (612) 221-0362 for more information.